The friends saw the twitter buzz last fall about the North Carolina Dining Competition; Fire in the Triangle and was interested to find out more about it. I volunteered to see how this competition worked, since it reminded me of Iron Chef, but only better. Since I am a newbie to this dining experience, I was interested in the history of how it all began. Background of Competition: The first competition; the original Fire on the Rock, held in 2005 in Blowing Rock, North Carolina, was organized by Mr. Jimmy Crippen. The competition was started as a way to build business during the off-season and has since exploded into a series across the state promoting local North Carolina ingredients, chefs and local restaurants. Jimmy Crippen was the owner of the acclaimed Crippen Country Inn and Restaurant in Blowing Rock, NC, which closed in 2013. The closure allowed Crippen to shift his focus to his Got to Be NC Competitive Dining Series full-time. He emcees each competition in the Fire series. In year’s past the competition has focused on five regions of the state, but host and creator Jimmy Crippen said the focus has changed to only three sections of the state – the Triangle, Charlotte and the Triad. Competing chefs will come from the surrounding areas of each region. Location: Fire in the Triangle, will take place in Raleigh at 1705 Prime. Mangalitsa (US spelling), Mangalitza (UK spelling) or Mangalica (original spelling) is a natural breed of pigs from Europe that are descended directly from wild boar populations. 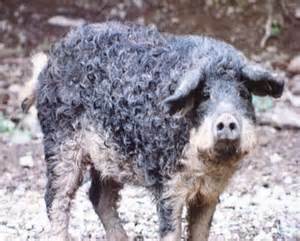 The Mangalitsa pig is unusual as it grows a hairy ‘fleece’, akin to that of a sheep. The Mangalitsa was formerly bred as a lard pig, and animals were large and round. Because of the drop in demand for lard, the breed’s popularity has declined and it is now regarded as a “rare breed“. Topo Distillery and the North Carolina Beer Guys supplied drinks. I loved my spicy Bloody Mary and the beer made with orange peel and minimal hops, which decreased the bitterness of the beer. While we were waiting a basket of bread supplied by La Farm Bakery was placed on our table. Not being shy and since the basket was placed next to me, I sampled a white chocolate baguette, which was phenomenal! I did not want to eat too much, so I could appreciate the gastronomical creations by Chef Fong and Chef Harris. The excitement was building and the clock was slowly counting down the time to discovering what the secret ingredient would be. The clock reached zero and Jimmy Crippen began his role of Emcee. He was engaging and entertaining. He introduced the Chefs and finally announced the secret ingredient, Mangalitsa Country Ham. How it works: Paying guests get to sample each course in a blind tasting alongside a panel of culinary and celebrity judges in a series of 15 dinner competitions hosted in the four regions of the state. Each evening, two restaurants “battle” it out, side-by-side, in a single elimination format. Guests savor a six-course menu (three dishes from each chef without knowing whose food they’re tasting) created around a “secret” ingredient. For almost all series, the secret ingredient will come from a North Carolina source. The secret ingredient is revealed to the chefs only an hour before they start cooking and it must be used in each of their three courses diners. Culinary, as well as guest judges, rate each dish and determine who moves to the next round and who goes home. At stake in each series is a grand prize of $2,500 and a coveted red chef jacket. First Course: Pan-Roasted Scallop, Logan Turnpike Stone Ground Grits, Saffron. Chili. Crispy Johnson County Mangalitsa Ham. Chef Harris and his team from the Midtown Grill created this. It received a score of 28.16. Second Course: Lavender and Thyme Seared Giant Sea Scallop, Rice Noodle Salad, Sautéed Parsnip & Johnson County Mangalitsa Ham, Currant-Cranberry Compote. Chef Fong of Persimmons Waterfront Restaurant of New Bern, NC prepared this. It received a score of 26.97. Fourth Course: Coffee and Johnson County Mangalitsa Ham crusted Certified Angus Beef Brand Rib Eye, Wild Mushroom, Mangalitsa Ham and Looking Glass Creamery “Ellington” Goat Cheese Risotto, Carmel Roasted Butternut Puree, Mangalitsa Ham and Citrus Brussel Sprouts, TOPO Old White Well Demi. 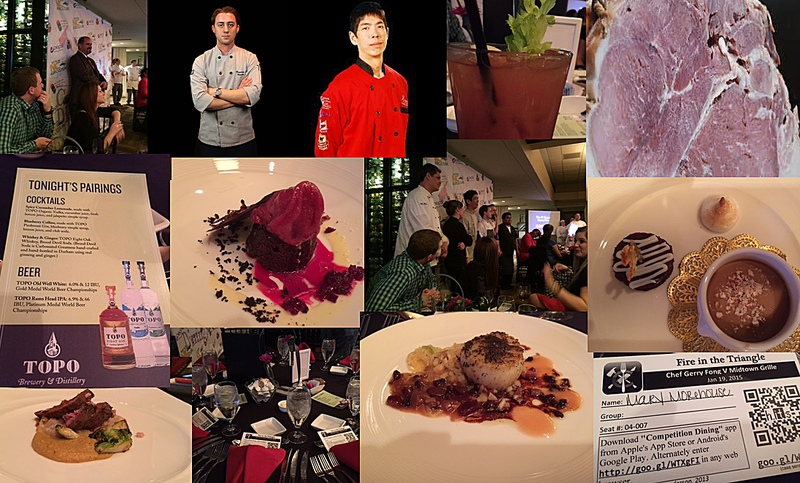 Prepared by Chef Fong with a score of 26.81. Fifth Course: Milk Chocolate Custard, Dark Chocolate Torte, Buttermilk Fluid Gel, Johnson County Mangalitsa Nam salted Carmel, “Fluff”. Prepared by Chef Harris with the score of 28.61. Sixth Course: Johnson County Mangalitsa Ham & Chocolate Stout Cake with Mangalitsa Ham and Pomegranate Sorbet, Vanilla Chil & Lime Anglaise Candied Beets. Prepared by Chef Fong with a score of 27.7. The winner was Benjamin Harris from the Midtown Grill with a score of 27.42 with a close win against Chef Gerry Fong with the score of 27.16. I had a great time. Both Chefs out did themselves with their creations. Mangalitsa Country Ham is a challenging ingredient. I was hoping for an ice cream from one of the Chefs, but enjoyed the desserts that were created. I loved meeting Stephanie Beck from WRAL Out and About. I know she follows Triangle Street Eats on Twitter, but I invited her to check out our blog and Facebook Page. I was also fortunate to meet Felicia Perry. She is delightful. I hope to run in to her again at other events. I loved the NC Beer Guys and hope to see them at the 214 Martin Street Beer Dinner with Raleigh Brewing Company Thursday night. I plan on attending more of these battles. I hope our readers will attend and follow our gastronomical experiences as well as our choices for Restaurant Week. Here are the upcoming NC Dining Competitions.